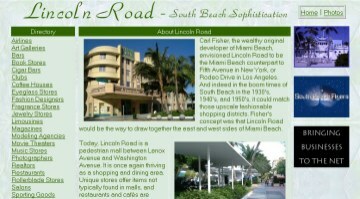 Description : LincolnRoad.org is the most comprehensive web portal bringing Lincoln Road businesses to a worldwide Internet audience. There are over 25 categories of businesses, and photographs to showcase the beautiful qualities of Lincoln Road. LincolnRoad.org is updated frequently to ensure information is current, and the site is quite popular with locals as well with people around the world. Advertising is currently available. For more information, visit www.lincolnroad.org.